This is the first in our Skill Builders' Series. Cabled Fingerless Mitts for Adv. Beginners. 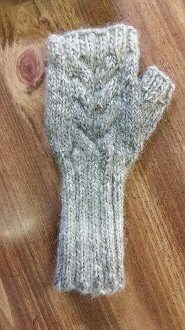 Explore new techniques with this series; in this pattern, you'll perfect ribbing, cables and a thumb gusset. Made from Cascade's luscious Eco Duo, an alpaca/merino blend that is just cuddly. Price of kit includes pattern and yarn.